On Friday Ms Malone, mr Williams and and I went to Crown Lane Studio’s to spend the day recording songs that year 6 had written. It was hard work and took huge amounts of concentration. We managed to get 7 songs recorded! This video will give you an idea of the day. As soon as the songs are ready I will put them up. Watch this space! My favorite memory was when we were writing our own song with my friend (J.A) because most songs convey the same message and J.A and I wanted to say something different. I really enjoyed playing all the instruments especially the drums.I was worried in the concert but the teacher was there playing it too so you get help. 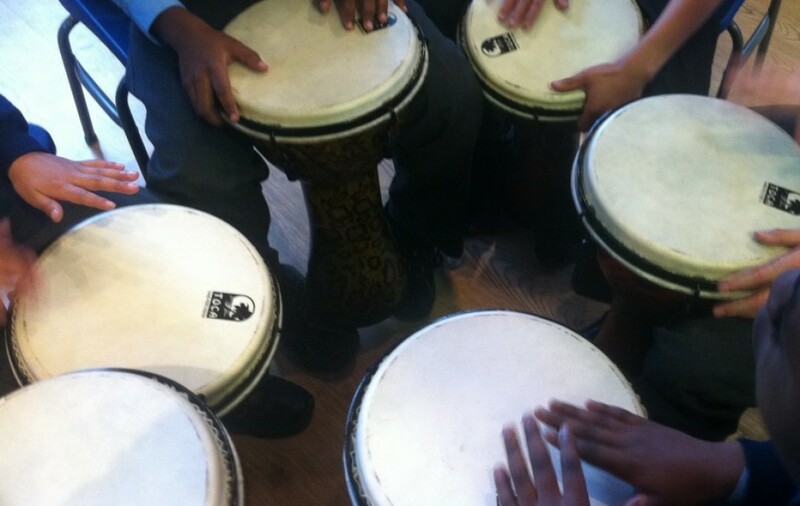 The reason I like Djembe is because I play percussion.The teachers were lovely thankyou. Thank you St. Teresa School especially to Mrs Schneider & Crown Lane Studio for this great experience & opportunity for our kids. They enjoyed and had fun recording. Great songs & music & beautiful voices of the kids, was very emotional listening to the lyrics of their songs. Well done Year 6!